“Hi there! One lovely day a couple of months ago several of my favorite wedding vendors here in San Francisco and I got together to create this very fun DIY wedding shoot with a dress that I found on Craigslist. Yes, Craigslist. It caught my eye and just days prior I had been talking with a few friends about how much we loved mint colored details. A few emails later we all jumped into action making our vision come together. About the Vendors: Kristen Calderaro is fantastic at makeup. Elisa Bunnell from the W Salon, blew us away with her skills with hair. Bonnie Harper with One World Designs made a beautiful hair piece and jewelry choices and Laura Sabahi with LS Blooms still has me drooling over the flowers. Jen’s Cakes was gracious enough to provide a perfect cake with mint accents…it was stunning! We cannot thank the Half Moon Bay Methodist Church enough for sharing their venue with us for this – http://www.cumc-hmb.org/ and we also must thank Rick Sigman for allowing us the use of his Chevy Truck. It really was the finishing touch! 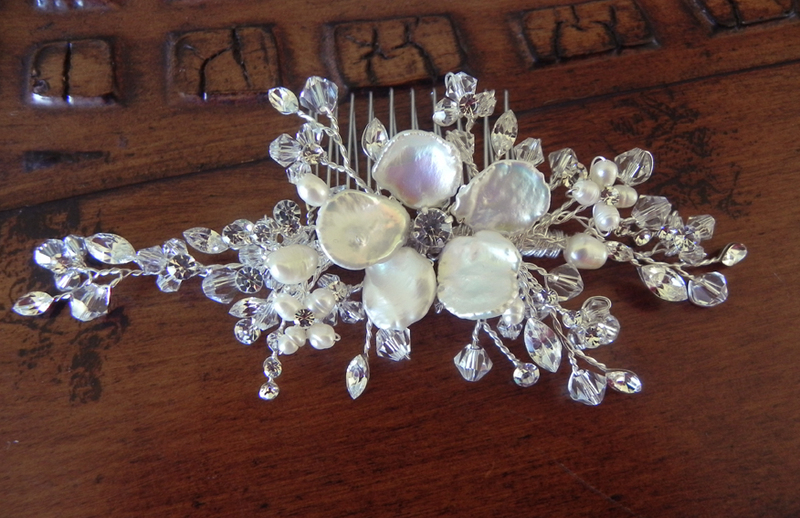 Been getting requests to add pearls to my popular Shannon Crystal Hair Comb – here it is: The Ashlyn Crystal and Pearl Flower Hair Comb, made of Swarovski crystals and rhinestone vines AND freshwater pearls surrounding a large Keishi pearl flower. 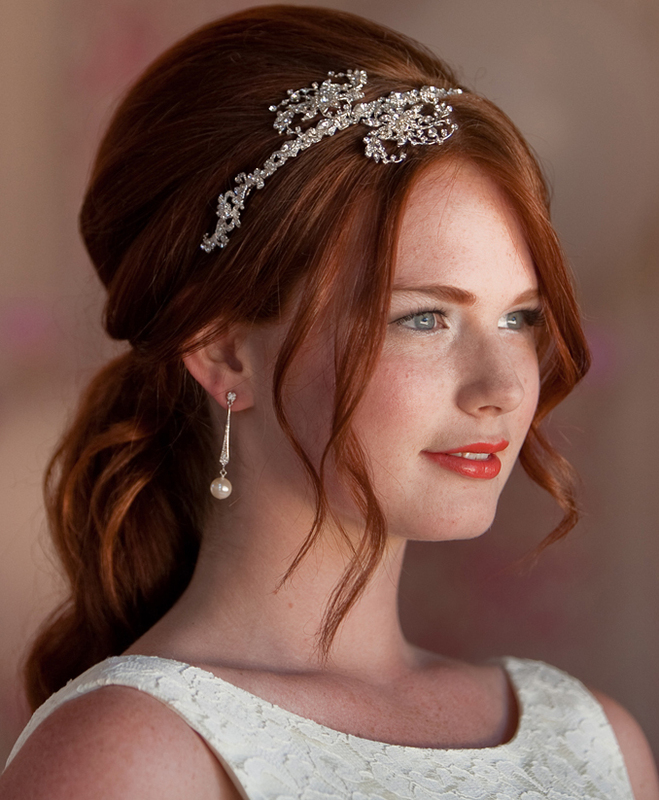 Looks beautiful on the side of your up-do – shows through your veil as you walk down the aisle. Can also be used as a veil comb. 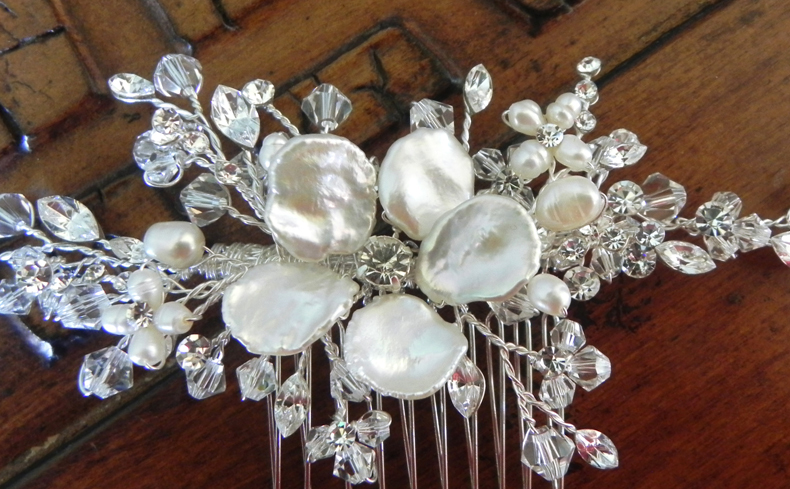 The ends of the vine are flexible and can bend to the shape of your hairstyle.The comb is 5″ long, 2″ wide and the flower is approx 1 3/8″ diameter – on a metal comb. Visit my Etsy shop, OWDJewelry, for details and pricing. At news stands now: Destination I Do magazine fall/winter issue – featuring Thuy and Harvey’s wedding with amazing photographs taken by the talented Caroline Tran! 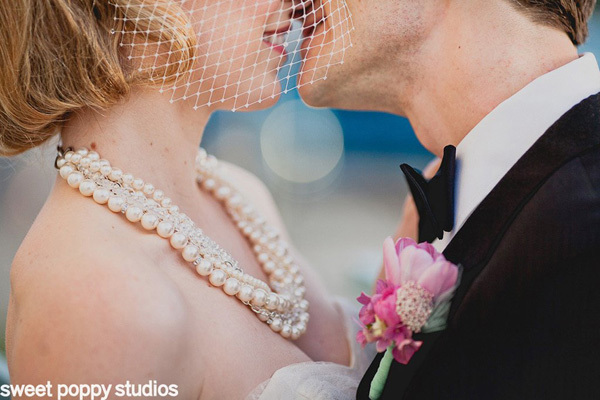 Thuy and I worked together to create her necklace and earrings to coordinate with her gorgeous Monique Lhuillier gown. She wanted to change her look for the reception, so we designed her feather fascinator which looks beautiful in her hair, styled by Taylor Pham. Thuy owns a custom invitation company, Paper Chez, and knows many talented people in the wedding industry, who came together to help bring her vision to reality (kudos to everyone for such a beautiful event!). Congratulations to Thuy and Harvey! 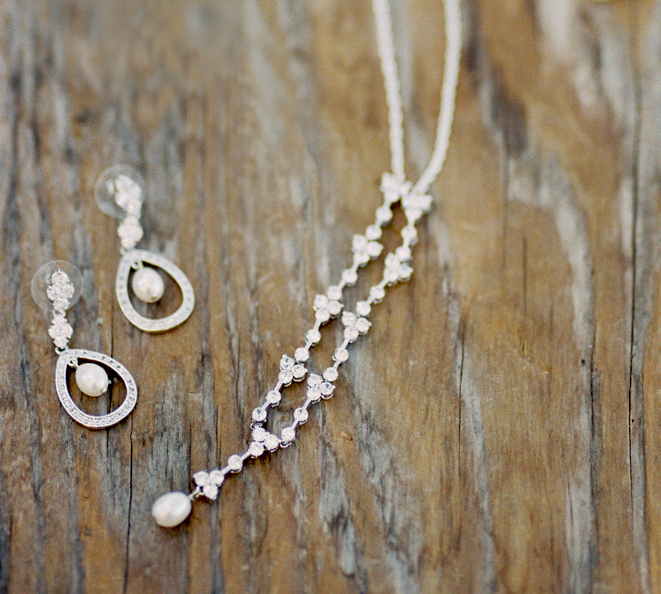 Ruffled just announced the winner of this weeks Sponsor Highlight Giveaway: Chelsea won a One World Designs Bridal Jewelry $55 Gift Certificate towards the item of her choice! Congratulations Chelsea!